FilConn Conversion Connectors are especially effective in today's system integration applications. Many times there is a need to install today’s technology in yesterday’s aircraft and this presents a unique challenge to the integrator in trying to find a cost effective and reliable way to mate the new with the old. At times this task requires extra interfaces and labor intensive low reliability splicing. FilConn Conversion Connectors provide a high level of reliability and simple “plug and play” connector to connector interface. At FilConn, Inc. we will custom design and manufacture your pigtail or reduction splice requirements internal to the connector at our factory so that quality and reliability are of the highest standard. 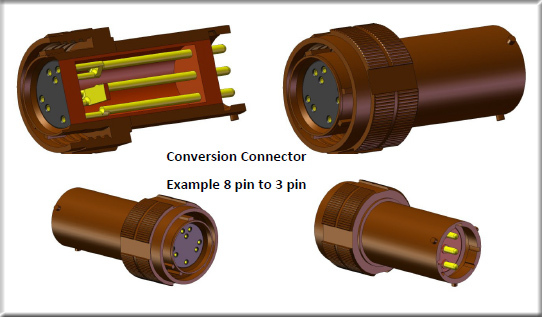 Options for conversion connectors are practically limitless: single connector to single connector reductions ranging from 125 pin down to 4 pin, single connector to multi connector conversions are also available.